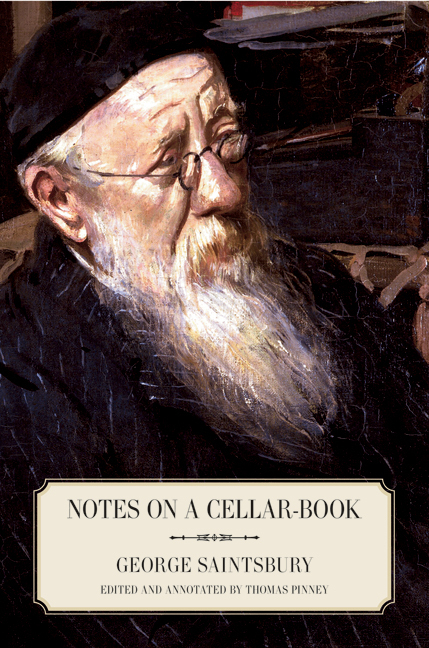 Since its first publication in 1920, George Saintsbury's classic Notes on a Cellar-Book has remained one of the greatest tributes to drink and drinking in the literature of wine. A collection of tasting notes, menus, and robust opinions, the work is filled with anecdotes and recollections of wines and spirits consumed—from the heights of Romanée-Conti to the simple pleasures of beer, flip, and mum. Thomas Pinney brings this unique work alive for contemporary audiences by providing the keys to a full understanding of Notes on a Cellar-Book in a new edition that includes explanatory endnotes, an essay on the book's legacy, and additional articles on wine by Saintsbury. George Saintsbury (1845-1933) was a journalist, reviewer, critic, editor, and Professor of Literature at the University of Edinburgh. Thomas Pinney is Professor of English Emeritus at Pomona College. Among other books, he is author of A History of Wine in America (in two volumes from UC Press).